Technology is improving, never standing still. This is clearly seen in the development of the WebM format for video content. Here we have something that’s free, that works on the popular HTML5 code and was researched and developed by Google; a company with obviously enough tech know-how and reliability to be trusted. Why then, would you want to use, for example, MP4 format? Do you remember when Blu-Ray discs first came out and you bought one and wanted to watch it with someone but couldn’t because they didn’t have a player? WebM is one of the newest and efficient video formats but not everyone has the capability to watch it. This includes some older mobile devices such as Android and iPhones and pretty much the entire Apple line. Even Internet Explorer and Apple browser Safari, still in use, only support WebM with plug-ins instead of native support. Therefore, if you want to ensure that your message, advertisement or even just a video short production is able to be viewed by the maximum number of people, it’s wise to have the option to change to a common format like MP4. Many converters exist but are either expensive or require command line/coding knowledge that you don’t have time to learn. 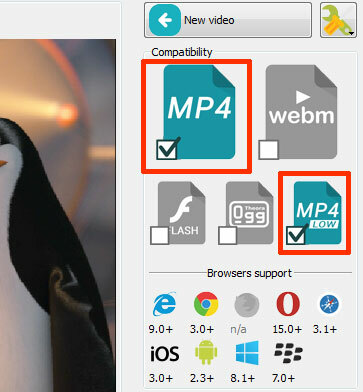 Discover http://easyhtml5video.com for yourself as it can easily convert webm to mp4!